Mackinaw City has been a pivotal location for the development of the Great Lakes for hundreds of years. 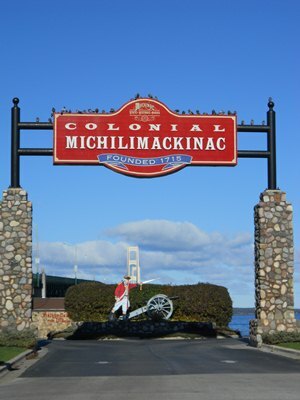 That history is captured at Colonial Michilimackinac in Mackinaw City. Fur traders set up shop in the Northern Michigan's Straits of Mackinac in the 1600s and by the 1700s, the area was a bustling trading center. The fort was built by the French in the early 1700s and it was occupied from 1714-1781 by the French and the British. Today, the reconstructed fort at Colonial Michilimackinac is a major tourist destination and historical site. Ongoing archaeological work at the Fort continues to uncover surprises and offer insight into life at the Colonial setting. Archaeologists first dug at Colonial Michilimackinac in 1959 and since then, more than one million artifacts have been uncovered. Michilimackinac State Park was established in 1909 and has 37 acres and 2,100 feet of shoreline on Lakes Huron and Michigan. Thirteen authentically reconstructed buildings allow visitors to see what life was like in Colonial times aided by interactive displays and reenactments by costumed interpreters. Colonial Michilimackinac is a great place for children: special activities and programs take place daily during the summer season. Special events take place throughout the summer season beginning with the Michilimackinac pageant Memorial Weekend where a reenactment of the 1763 Native American attack on the British held fort takes place. Colonial Michilimackinac is a real gem: when visiting Northern Michigan, a visit to this fort is a must.